I’ll be honest that I’m still adjusting to the reality of the national election’s results. But every day the sun continues to rise, and what seemed nearly impossible just days ago is more normalized. 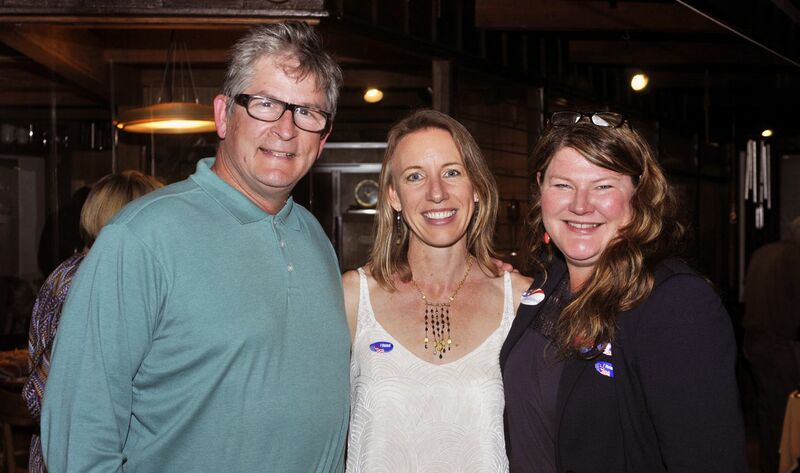 Victorious City Council candidates Tony Kranz and Tasha Boerner Horvath at our vote-watching party on election night. So what did the voters tell us with the election here in Encinitas? I believe the most important take-away is that Encinitas residents are happy with the change in the City Council’s direction that began four years ago and has continued over the last two election cycles. The current City Council’s focus on environmental protections, open governance, better mobility, and investment in the community’s future, as evidenced by the purchase of the Pacific View school site, was affirmed by the election results. The city spends a lot of time and energy on high-level, aspirational “master plans.” These big-picture documents take on real significance when concrete action like this is taken. Reducing the amount of plastic foam blowing around on our city’s beaches and in the ocean is an important step forward. We’ve spent the last nine months in partnership with the Solana Center, reaching out to the 212 local businesses that could be affected by this local policy. Of those, 123 food providers had already eliminated Styrofoam, including most major chains whose corporate policies don’t allow it. To help the remaining restaurants transition, the city is offering incentives for early compliance – between $250 to $750 to help offset the cost of purchasing alternative biodegradable products, if the switch is taken within three months of the ordinance adoption. The ordinance becomes effective within six months. These efforts show the City Council’s commitment to the environment and to the business community by easing the transition. We continue to be blessed by the generosity of the Surfing Madonna Oceans Project, who offered to provide the grant money. About 75 people emailed me in advance of our Styrofoam decision — the vast majority in support — and the room was packed with mostly supportive speakers. This is an inspirational example of the benefits of standing up for what you believe in – thinking globally and acting locally. Lisa Shaffer recalled watching an Encinitas City Council meeting five years ago when the same proposal to ban Styrofoam was roundly rejected by that Council majority. Political and social activism does matter and helps create the world we want. I completely relate to the concern in Encinitas over future growth. I recognize this as an extension of the battle over land use and protecting our community’s character that spurred our city’s succession from San Diego County 30 years ago. The voters have spoken in rejecting this housing plan. But state housing laws remain the same, so we’ll need to work together to find a path toward compliance. At next week’s upcoming City Council meeting, I’ll be asking my colleagues to authorize me as a liaison to work with the community and activists opposed to Measure T, as well as the state housing regulators, the city planning staff and our attorneys. I’d like to have an honest and inclusive dialogue about the possibilities, including acceptable community outcomes grounded in the realm of what’s legally acceptable, for City Council consideration. Another important issue at last week’s Council meeting involved an appeal from neighbors in Leucadia over the permit for a four-unit residential and office building. As I watched passionate speakers on both sides, my overriding feeling was that the fundamentals of local American democracy remain strong. Aggrieved neighbors exercised their due process right to appeal, residents enjoyed their First Amendment right to speak, the decision-making and deliberative process were transparent and public, and there was an orderly acceptance of the legitimacy of the outcome. This reflection on the health of our local fundamentals heartens me. P.S. 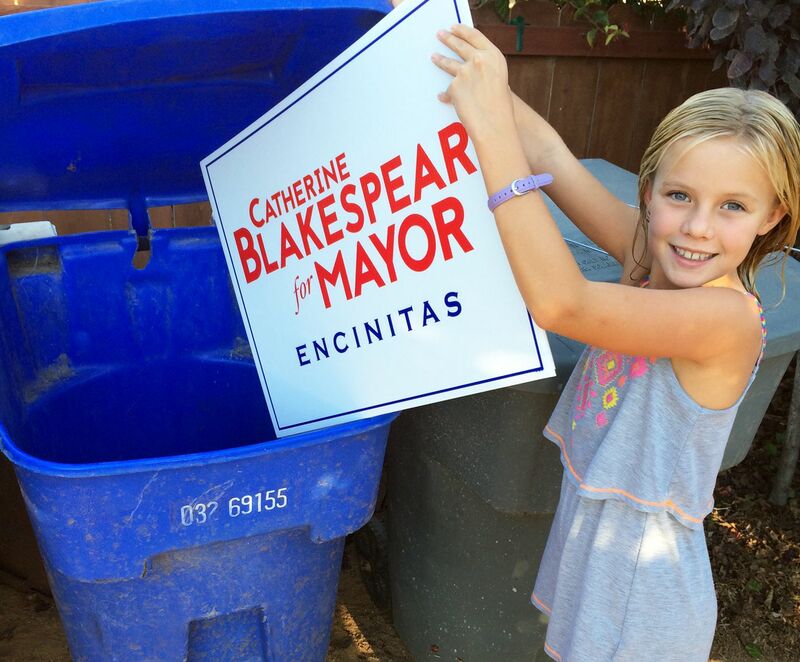 It’s official – campaign yard signs are recyclable in your EDCO recycling bins! Unfortunately, the metal stakes have to go in the trash, but consider using them for plant support structures in your garden. Speaking of campaigns, I’d like to take this opportunity to thank the amazing members of Team Blakespear who gave everything they had to assure our victory: Campaign Manager Scott Chatfield, Volunteer Coordinator Kris Powell, Signage Coordinators Ron Dodge and Niels Lund, Graphic Designer Charlie Wylie, Treasurer Simon Mayeski, and every one of you who pitched in with such gusto! Previous Post11/9/16: Mixed Emotions As We WinNext Post11/20/16: After Measure T, What’s Next?